It’s been a long time. Thirteen years since Stormy and I left Bulgaria. The way time is speeding up for me as I get older, though (I try not to think of it as circling the drain), it doesn’t seem very long ago at all. For a while, back then, I was a teacher of the English language. I loved that work. My love of language and teaching was enriched not just by being in a distant and unfamiliar place, but also by being part of the sweeping economic and social changes in early 2000s Eastern Europe. It was a shifting frame of reference applied to an unknown starting point while taking on a new vocational challenge. A few years ago, when I wrote the first in this series of blog articles, a young woman who had been in one of my English literature classes wrote a comment expressing her appreciation for my part in her education. Melted my heart. We stayed in touch. A former student became a special friend. That girl, now all grown of course, now lives in Australia. That, for her, was the fulfillment of a longtime dream. Far away in the Land Down Under, she is up to her ears in young-family things like Baby’s first accomplishments in each category, children’s birthday parties, juggling work and childcare schedules while both adults work full time, and walking the dog. Busy, involved, doing the things that people want to do. It was totally unexpected, then, that she should reach out to me as a friend and offer to host us for a visit. Australia! Could we really go there? Would Australia have pizza? Well, yes to all! Our flight, featuring the lowest fare I could find, went through Beijing. A little long but hey, China! We planned for a “layover tour” in Beijing since we were to have a few hours there. Just before boarding in LA we got a call saying the tour operator had advised we call it off. Big convention in town, they said. Streets would be jammed, with roadblocks materializing in unpredictable patterns. Once we were aboard, reading an English-language copy of the China Daily, we learned what it was: a big deal, the National Congress of the Communist Party of China. “China Will Erase Poverty by 2020 Goal, CPC Says” and “Political Reforms Have Been Historic, Spokesman Says.” Sounds great, too bad we weren’t invited. Move China higher up on the bucket list. Next time. On to Australia! There is a lot to see, and the most impressive is simply the vastness. Flying in on a clear spring day as we made landfall southbound from Darwin, I thought at first it looked like the arid plains of West Texas, but soon I realized one big difference: where the American West is latticed with section lines, highways, and cultivation of all kinds, in the Outback of Australia for vast stretches there are none. No mark of man. We cruised over a huge desert area with miles-long red and grayish streaks running north and south, then another stretch with long narrow alkaline lakebeds in the same orientation. Cattle or wildlife trails, following terrain and ending nowhere. Then after crossing a river that formed a clear boundary as if drawn on a map there was wind erosion, blowing sand patterns, a bone-dry bleached desert. Roads and paths went from none to scarce, then some dry riverbeds, then creeks and rivers with water. 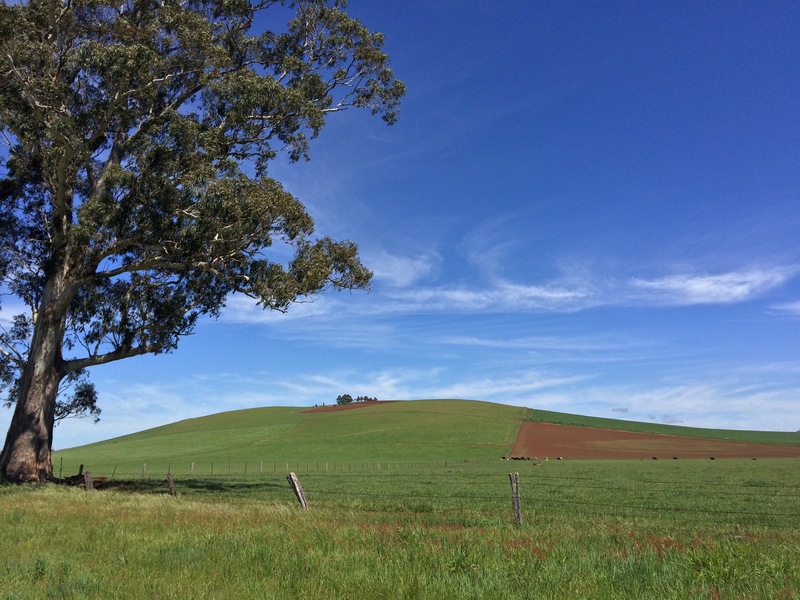 An hour north of Melbourne, a house, then some more, and then soon after I could start to make out huge, faint rectangular patterns of cultivated fields. From there on in the signs of human life and work grew more and more apparent and it became the city of Melbourne, an airport, Customs, and a friend waiting for us. We had read up on the whole country before coming, a book by Bill Bryson called In a Sunburned Country. He enumerated at length the sheer number of things that would kill you – virtually all of the many kinds of spiders and snakes, lizard-like crawlies, toothed and fanged creatures including of course crocodiles. Our visit was not deadly. We did see the largest crocodile ever, in the Melbourne Aquarium, but he seemed to be napping. Kangaroos! 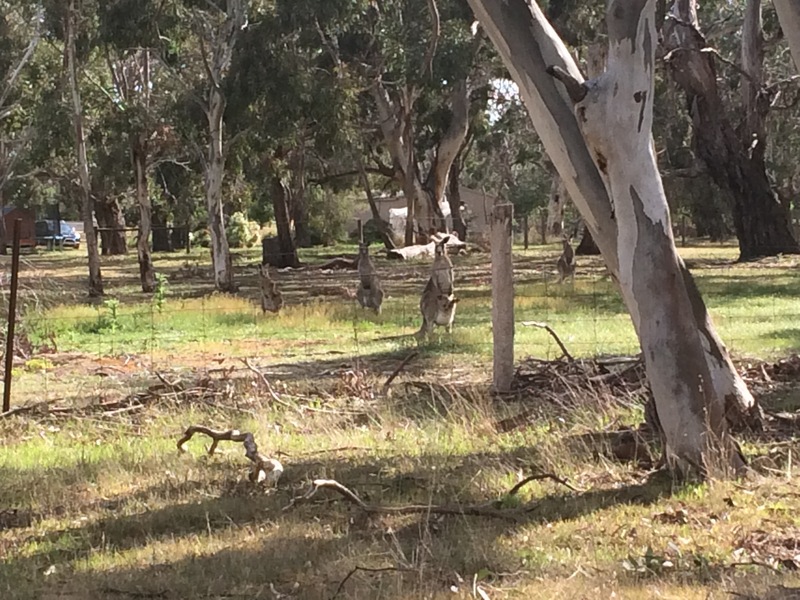 We saw them out in open fields, in shady gum tree groves, and in the zoo. These in the picture were in someone’s back yard enclosed by a wire fence, and they bounded right over the fence and away when they judged we were close enough. Melbourne is about the easiest large city in the world to get around. Free trams, friendly people, lots of museums and parks, and I think we did it all. Walking along a rocky breakwater near the port, we saw penguins. Penguins, I tell ya, preening and grooming each other and making their wheezy cooing and clucking sounds to beat the band. Penguins! There were more in the zoo, the larger ice-loving kind, but right there in the rocks at the beach we saw penguins! We came out ahead, as travelers often do, by taking some wrong turns. Each one resulted in an unexpected benefit: we saw a wallaby on one wrong-way hike, saw a rare kind of deer up in the hills from a dirt road that was not on our planned route, and when we ran off another road into its boggy shoulder, leaving the car hubcap-deep just off the paved surface, we met the nicest most cheerful people who hooked up and pulled us out. G’day mate! The best part of the visit, though, was the family joy we were made to feel a part of. Slavka and her family treated us like bonus grandparents. To have that kind of welcome so far away from home in a part of the world we never thought we would get to go, well, it’s something to write home about isn’t it? As I write this, poking at the tiny keys on my phone, we’re on our way back home. It’s been a fair dinkum fortnight. (I don’t know if they say fortnight. Two weeks anyway.) We feel like we did up Melbourne pretty well for beginners. The rest of this awesome country will just have to wait for the next trip. Always great to visit family, no matter where. It’s great to hear the details of your trip and to see some beautiful photos. and actually leaving the house to visit you guys. Thanks Judi! Slavka made a Facebook page where she and we put up more photos. facebook.com/brucenstormy And hey, we’d love to show you some Colorado. Come on out! I backed out of the comment I was making only to find out that it wasn’t saved. Anyway, what I was trying to say is that I’m so glad you decided to bite the bullet and go. You are both so brave, as always. I am not a brave traveler, but a friend (travel agent) has now signed me up to go on an Alaskan cruise. My daughter Peggy will be going with me, and I’m depending on her to watch over me so I don’t get lost. I have never been on a cruise. My parents traveled a lot, and loved Australia and New Zealand. I can’t remember which country it was, but one time an emu chased my dad around. One of the best bullets we ever bit! It’s easy to be brave when we can be in touch with such good and helpful friends. I’m glad we didn’t get chased around by strange animals. Makes a good family story though, and sharing memories like that is great for families. I expect you’ll love the cruise, and enjoy the Alaska experience. Good for you! I so enjoyed your delightful narrative on your trip down-under. You obviously had a wonderful time and saw a lot and were able to visit dear friends….and your survived a very long time in the air! Would like to go to visit Australia one day but in the mean time your story made me feel like I had a visit too. Thanks, Bruce, for sharing. Nice post, man. Thanks for the laugh (circling the drain), excitement over the penguins, and the warmth in all of your descriptions. So cool to see the joey in the pic. Just getting around to reading this, Bruce. What a wonderful experience at so many levels; and such a great story — from “B” to “A.” Seize the moment — that sure is the way to live, nali? Warmest regards to you and Stormy. Thanks. I like your blog too. There are several British expat blogs already on my blogroll, and I added yours as well. We have only been Back to Bulgaria once since we lived there 2002-2003, but maybe we’ll see you there in future. We love V-T, and your villa sounds lovely!